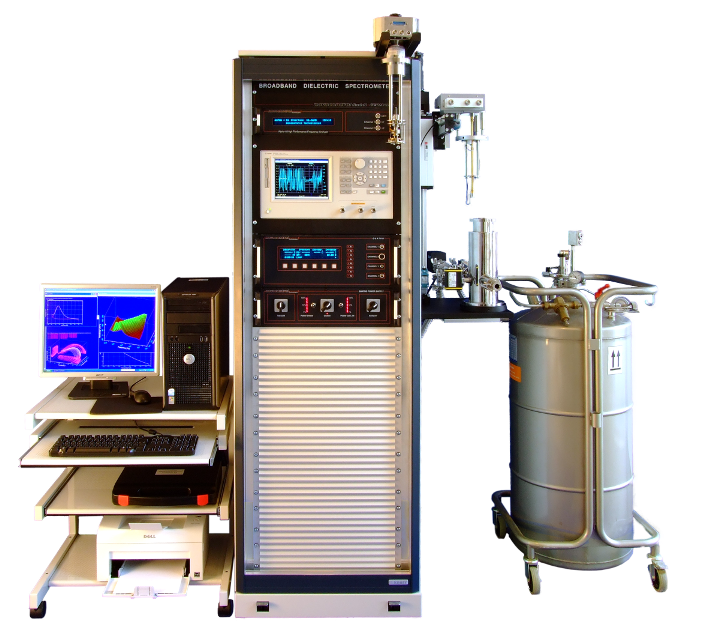 A dielectric, conductivity and impedance spectrometer for material analysis measures the electric properties of materials over wide ranges of frequency and temperature. This is done by measuring the impedance Z*(ω) of a capacitor made up by two ore more electrodes with the sample material in between at a controlled temperature. From Z*(ω), the complex permittivity ε*(ω) and conductivity σ*(ω) spectra are evaluated. A system to measure the complex impedance Z*(ω) of the sample capacitor over a sufficient frequency and impedance range. In practice, the molecular and ionic relaxations are typically spread over a broad frequency range and an even broader impedance range. In addition, the ratio of the Z*(ω) real and imaginary components quantified by the loss factor tan(δ) may exceed several decades. For low-loss dielectrics, tan(δ) is particularly small. 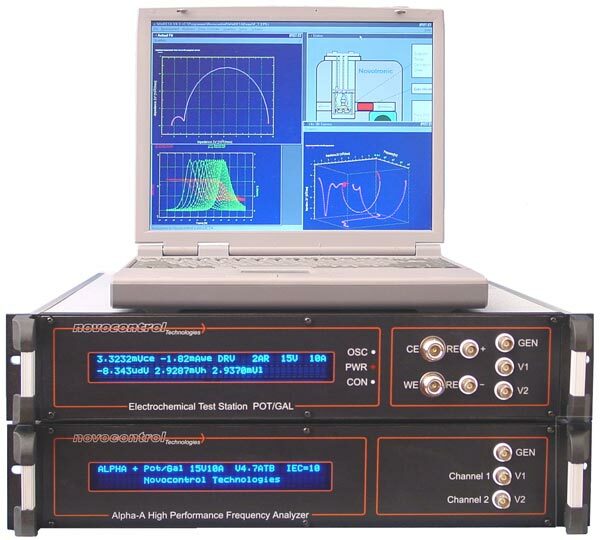 Up to 40 MHz, the measurements use the Alpha-A, Alpha, or Beta dielectric analyzers. These are highly optimized for material measurements. 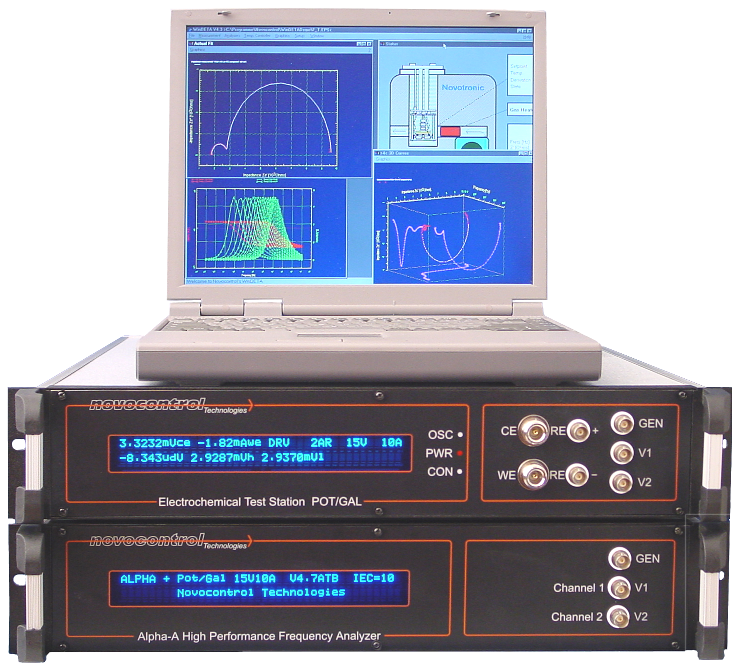 Compared to general impedance analyzers for technical applications, these dielectric analyzers provide an extremely widened impedance range (extended by more than six decades up to the 100 TΩ regime) and a phase or tan(δ) accuracy typically better by about 2 decades. At higher frequencies, i.e., from 1 MHz to 3 GHz (8 GHz option), an RF impedance analysis system, based on coaxial line reflectometry is used. 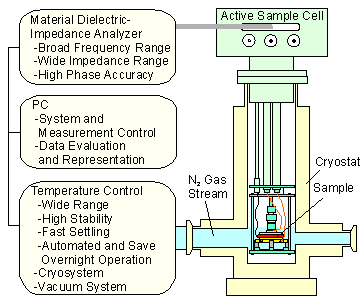 A sample cell which connects the sample capacitor to the corresponding impedance analyzer and allows its proper mounting into a cryostat for temperature control. As the front end device to the sample, the cell design is extraordinarily critical, too. Particular care must be taken to avoid any interference from the cell isolation and lines with the measured results. This applies especially for low-loss dielectrics where the electrical properties of the cell isolation are of the same order of magnitude as the sample itself. The cell as a whole and its isolation in particular must be designed to operate in a huge temperature range from cryogenic temperatures up to e.g. 400 °C. Finally, the cell has to be optimized for high frequency performance which generally conflicts with high impedance low loss isolation. In the Novocontrol systems, active sample cells are available with the impedance converter integrated into the top part of the cell. This allows to use short air insulated lines connecting the impedance converter to the sample capacitor. These lines can be optimized both for high frequency, isolation and temperature performance. A temperature control system which adjusts the sample capacitor to fixed temperatures or continuously changes temperature. The system should match to the sample cell, cover a huge temperature range, stabilize precisely within short times without overshooting, and allow fast temperature rates. As material measurements may run for long times, automatic, precise, economic and safe operation over several days is mandatory. A computer with a software package for system control and evaluation. System control software constitutes an essential part of a turnkey measurement solution as it represents the interface between the user and the measurements, supports the user in setting up the system, controls the set-up and performance and prevents inadequate inputs and system states. The software controls the complete system hardware. Measurements are most often done not only in dependence of frequency and temperature alone, but also in dependence of other parameters like time for monitoring of curing processes, dc bias for detection of nonlinear properties, or pressure. Therefore, an important software requirement is to support multi-dimensional measurements both for flexible experiment setup and data evaluation. Usually, separate packages exists for non-linear curve fitting and modeling. The Novocontrol WinDETA software matches all these requirements. In addition, a multi device concept is implemented. Important impedance analyzers by other manufacturers and several temperature control systems are supported in one common user interface. 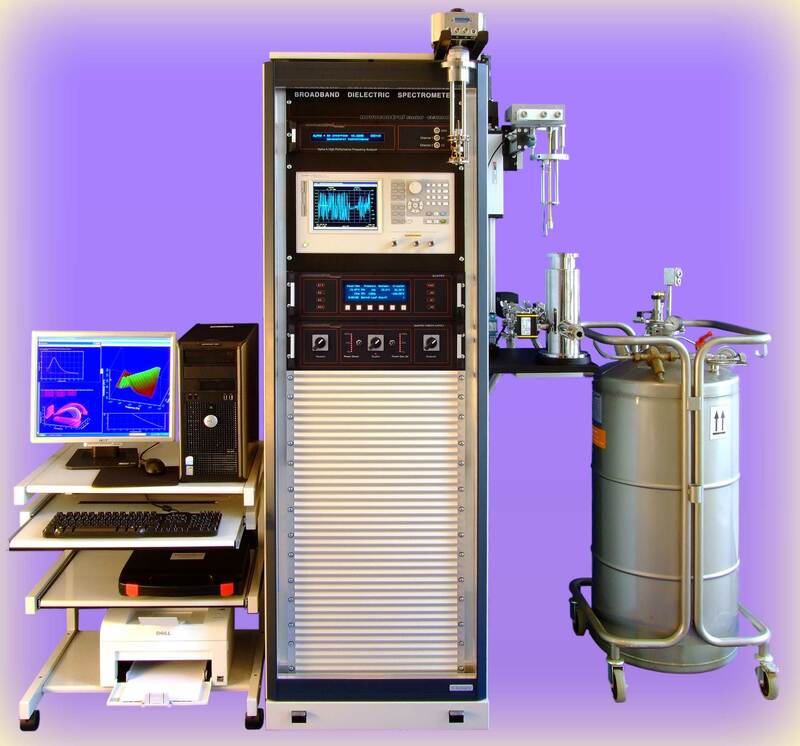 The WinFIT curve fitting package implements in addition to the standard impedance evaluations the complete evaluations procedures for molecular relaxation analysis.